It's funny to be sitting here and doing my monthly favourites. Not because the month has gone exceptionally quick (it has gone at a decent pace though) but because looking back I feel like I have done a lot of manis but based on the amount of blog posts I have done much at all. All that said, this monthly favourites post will be on the small (ish) size. Let's take a look shall we? I have been loving skittlette manis this month. They are so fun to wear. I can definitely see me wearing more skittlette manis in August as well. Again, it's really not a "Tracy" favourites post without a multicoloured sponged background with black stamping so course there are a few of those manis. There isn't any plates that I have played with this month that I haven't love so I am including them all. Big fan of this plate. If I did have to pick only one of the two plates from this series I would say that Dress Your Nails 01 would be my pick of the two. 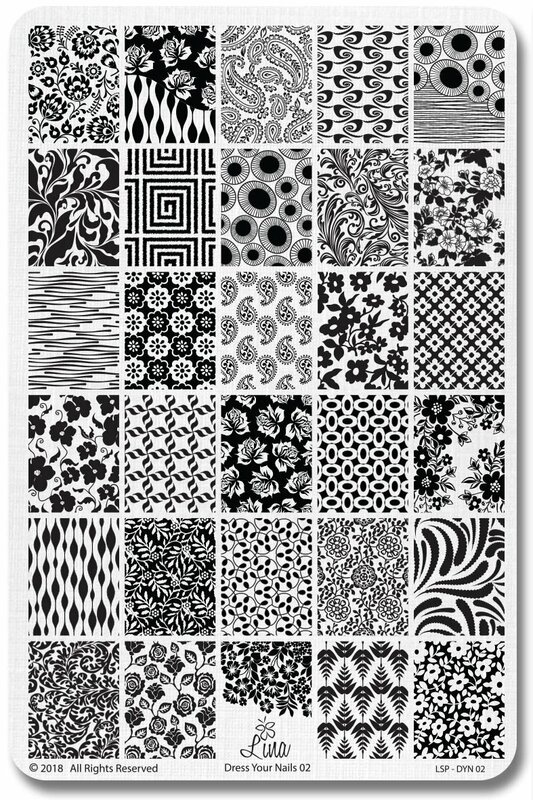 This collection is one of those collections that I really had a hard time trying to decide which plate and which image first. You know that that is a good sign of a plate. I love the images on this plate! I can see me grabbing for this plate a lot! I have only tried two collections from mainstream brands this month - OPI Grease Collection and Sally Hansen + Crayola Back To School Collection. Both of the collections to be honest weren't overly exciting in terms of their colours, however I do have to say that I am really impressed with the Sally Hansen's formula. As I mentioned the colours in this collection aren't overly unique, however the formula's are amazing! 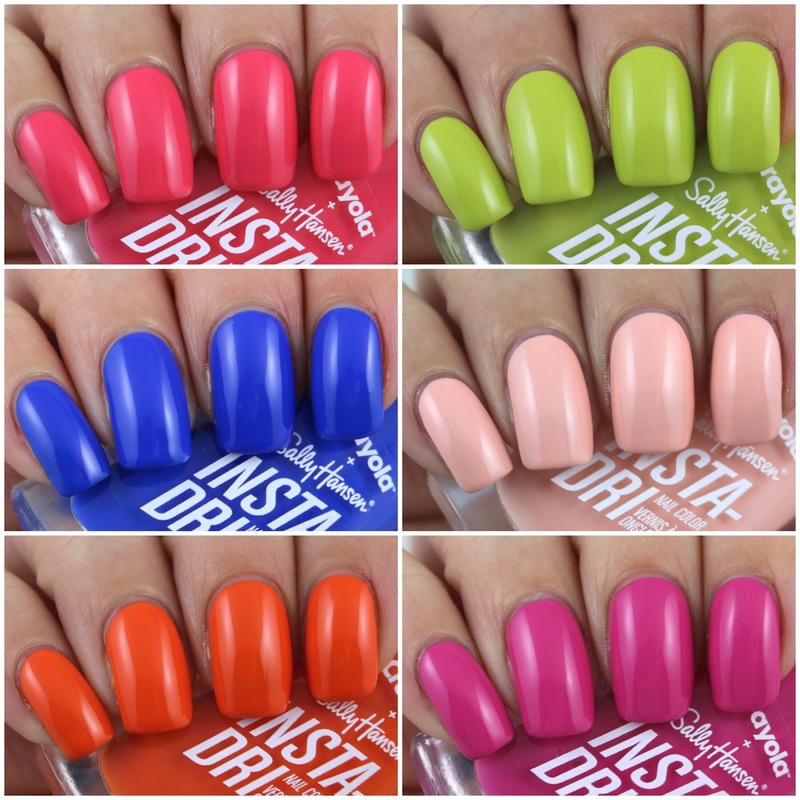 I do also really like these colours for nail art (as you can see in my nail art at the top of this post). I am seriously hoping that Australia get the remaining colours from this range because I definitely need them in my collection. Indie brands never let me down! I don't think there has ever been a month where indie's aren't represented in my favourites posts. The indie girls really do make the best polishes! This month's release has been amazing from Emily de Molly. My personal favourites (and yes I am aware I am about to list the bulk of this release but I really do love them!) are Dormant Fractures, Evening Mist, Made Of Emotion, Perfect Moments and The Grey Silence. While the Charmed Again Collection is a great collection, there is really only one absolute stand out for me. - Gram's Unicorn. It is such a me polish! Love, love, love it! That is July done. I am hoping that August I will be able to get some more manis done. I do have quite a bit of new things to play with which is exciting. What have been some of the polishes and plates that you have been loving this month? 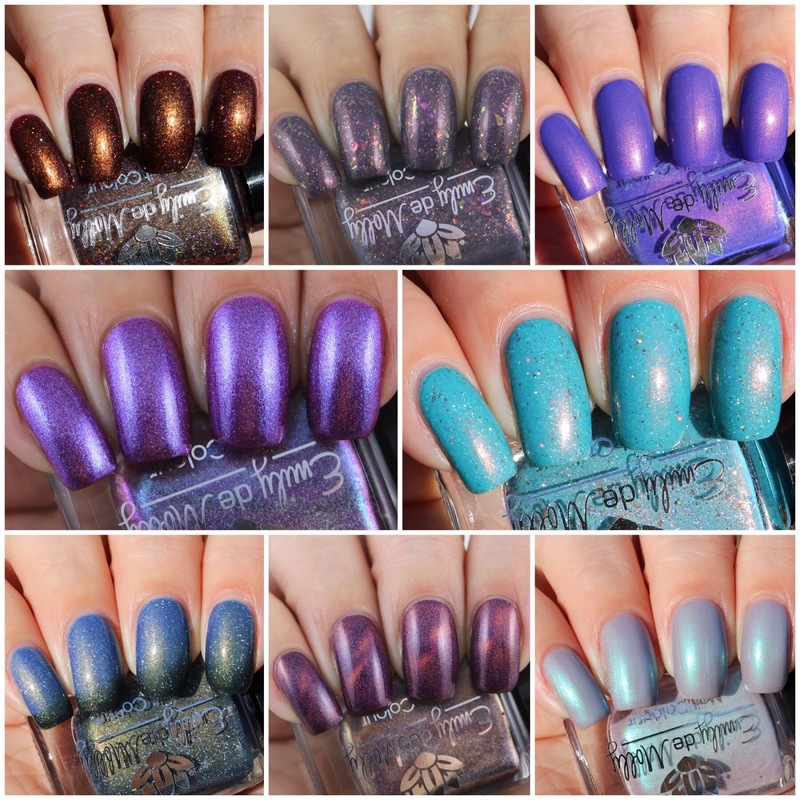 I don't know about you guys but it seems like a little while between Lina Nail Art Supplies' releases, or is it just me? I know I still have a few of their plates waiting for me to swatch and review but those I have had since one of the releases from the start of the year (yes I know - I need to get around to getting through all my things I have purchased). 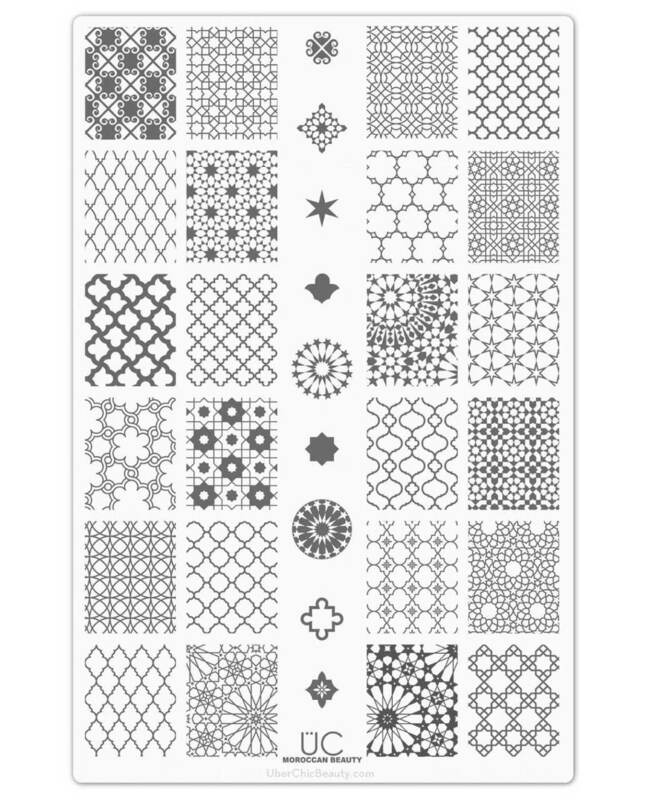 Anyway, in the most recent release is the second addition to the Dress Your Nails stamping plates. I have previously reviewed the first plate here and today I have the second plate to share with you. This first mani is a very simple one. For my base I used OPI Pink Ladies Rule The School and stamped using Hit The Bottle Snowed In! Another simple one (I do quite like simple manis). My base is OPI Hopelessly Devoted and stamping polish is Hit The Bottle Rose Gold Glow. As this is a metallic stamping polish is doesn't come across as pretty as it looks in person. Skittle manis like this seem to be my go to at the moment. Polishes used are OPI Was It All Just A Dream, Solitaire and Hit The Bottle Snowed In. 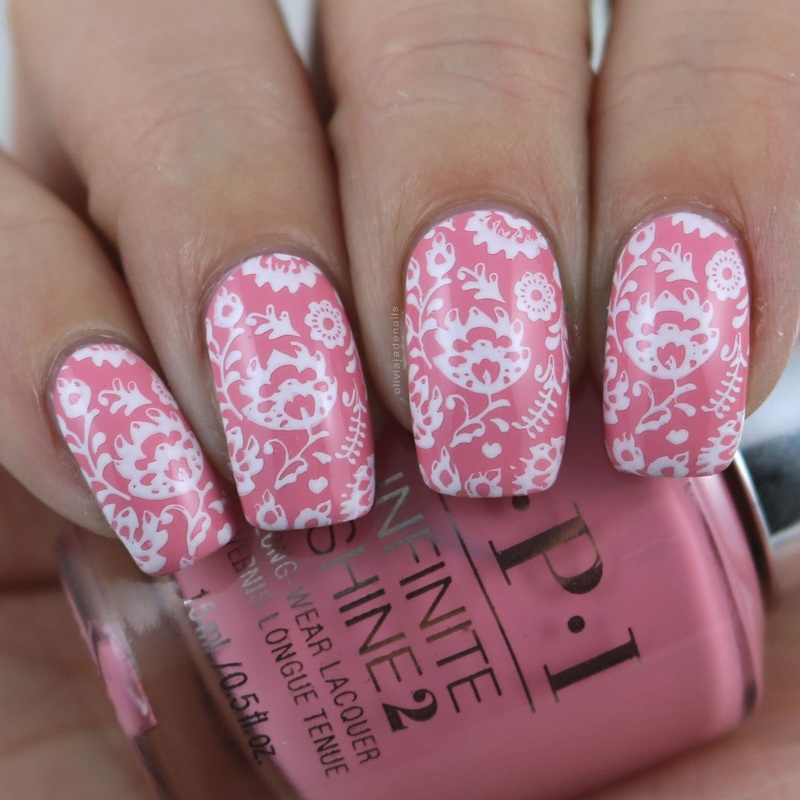 I received two pink stamping polishes to swatch and I thought they looked really pretty together. 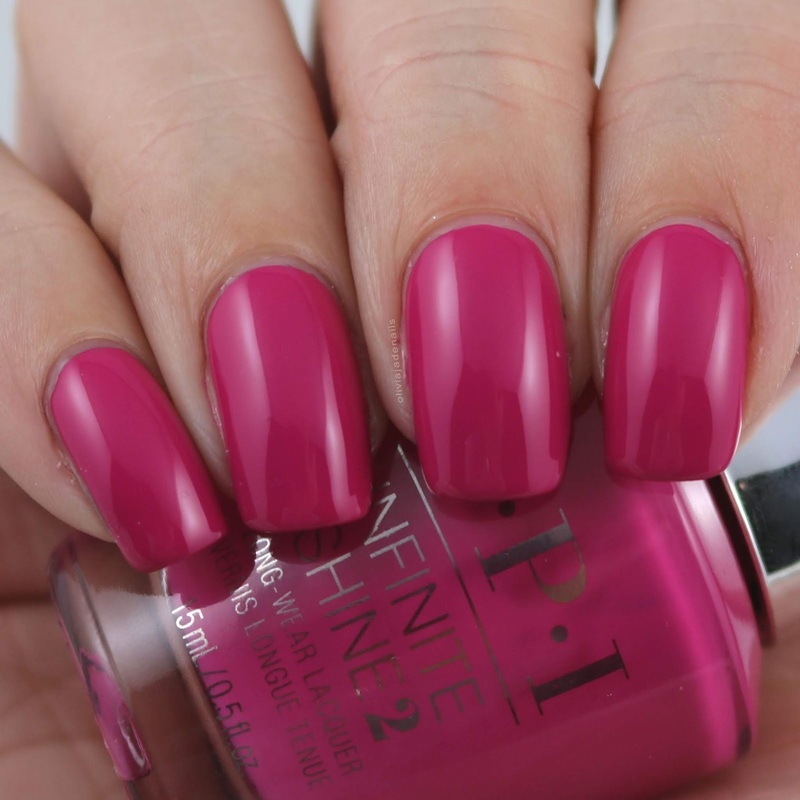 Polishes used are OPI Meet A Boy Cute As Can Be, Hit The Bottle Join The Cerise Force and Having A Quiet Pink. 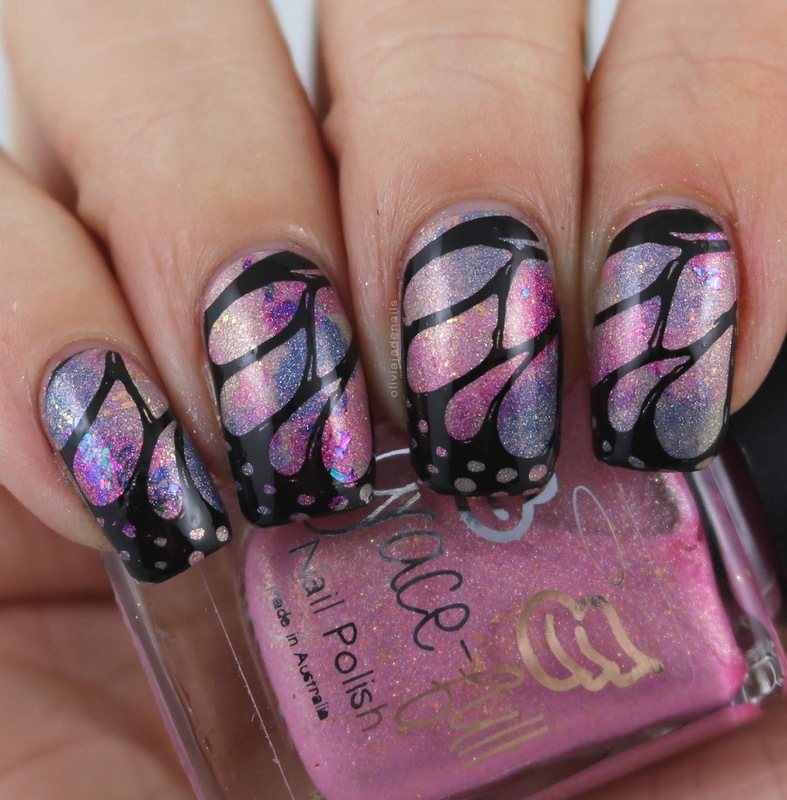 This is probably my favourite of the manis that I have done using this plate. Polishes used are Pretty Serious Cosmetics Fluffykins, Dollface, Peachy Poo and Chicky. Overall I really like this plate. There are so many great images that I can see myself using time and time again. They all stamp beautifully as well. 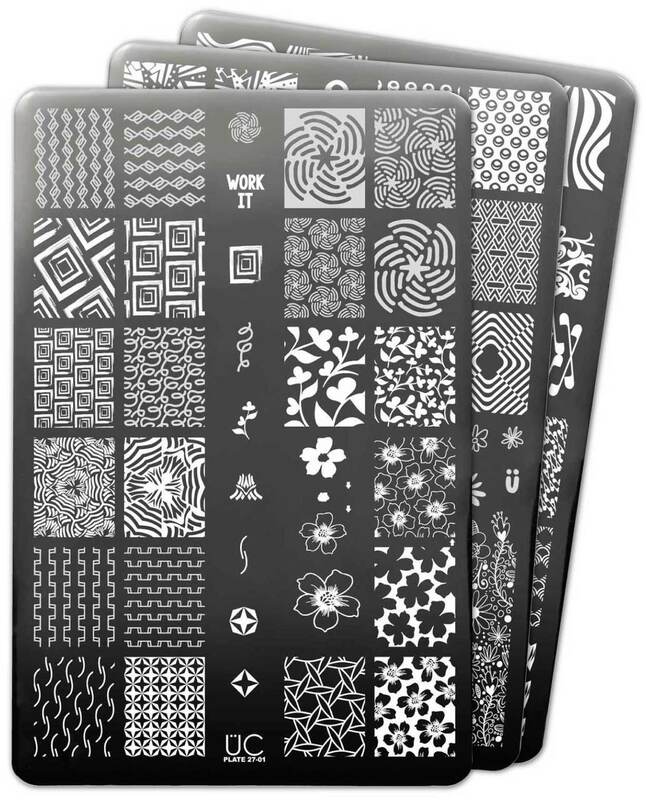 Dress Your Nails 02 stamping plate is available now from Lina Nail Art Supplies and Hit The Bottle. Happy Friday everyone! I am excited for this weekend. It's going to be busy but lots of fun. My daughter has been invited to three birthday parties plus has her usual gymnastics training. I imagine she is going to be pretty tired come next week. Anyway, I'm sure you didn't come by to hear about my plans for this weekend - instead you are here to see the latest OPI Grease Collection. Yes I am aware that the Grease Collection has been out for quite sometime in the US (and you guys have also got another new collection already) but the Grease Collection was only recently released here in Australia. I was sent eleven of the twelve polishes to share with you. Chills Are Multiplying is a royal blue with blue shimmer. This is such a nice rich colour. The formula is great and it is opaque in two coats. Danny & Sandy 4 Ever! is a charcoal shimmer. This is a nice colour. I did find the formula a little sheer but it is easy to work with. I used two coats for my swatch, however it is still quite see through at the tips so next time I would do three coats. Don't Cry Over Spilled Milkshakes is an off white cream. This one is kinda an odd colour if you ask me. It's a little too yellow to be white, and too white to be a yellow. It's definitely more yellow toned in person than it looks in my picture. I'm really not sure I am a fan of the colour. My swatch shows two coats. 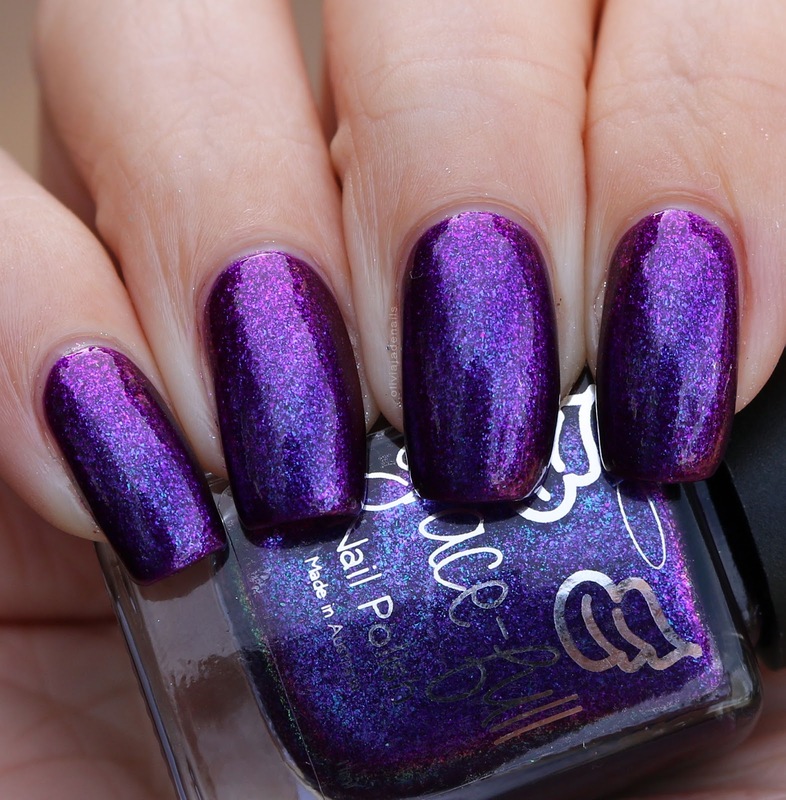 Frenchie Likes To Kiss is a pale lavender with a purple shimmer. 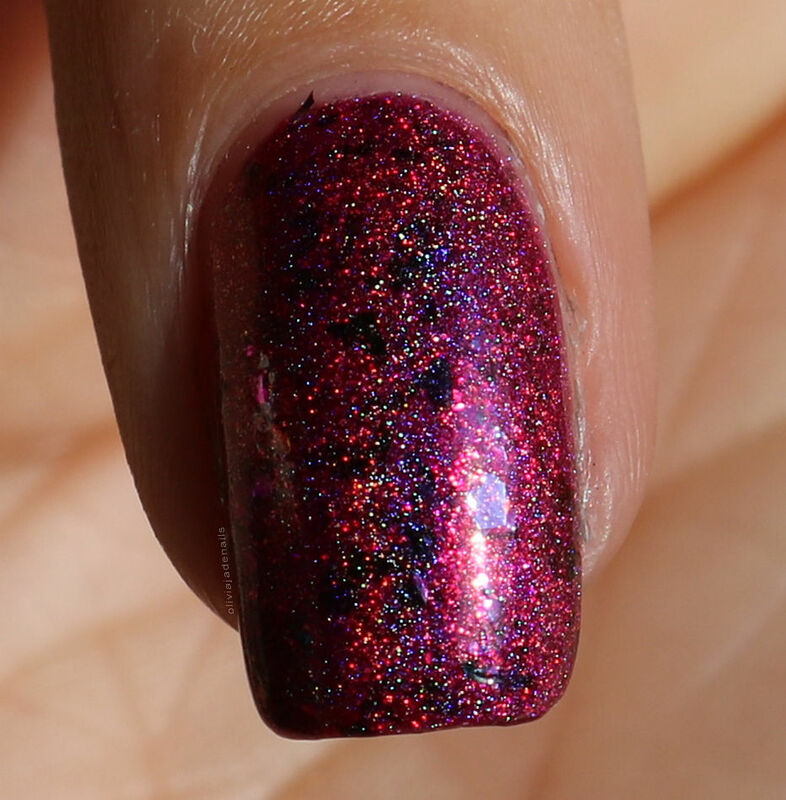 The shimmer is quite obvious in the bottle, however it really doesn't transfer to the nails. It is barely noticeable at all so that is disappointing. The formula does apply unevenly and needed three coats to even out. Hopelessly Devoted To OPI is a light peach creme. I think this is a nice peach colour, however I am not sure it agrees with my skin toned. It does apply unevenly on the first coat but evens out on the second coat. Meet A Boy Cute As Can Be is a pale yellow creme. Really nice colour. The formula does apply unevenly (which is to be expected for such a light shade). I used three coats for my swatch. Pink Ladies Rule The School is a muted pink creme. I don't love this shade of pink, but I also don't hate it. The formula is great and is opaque in two coats. Summer Lovin' Having A Blast is an orange creme. This is the perfect orange for Halloween. Don't ask me why but it gives me Halloween vibes. The formula is great and easy to use. I used two coats for my swatch. Tell Me About It Stud is a bright red. I'm not really a fan of red polishes but I can appreciate this polish in this collection. The formula applies evenly and is easy to use. I used two coats for my swatch. Was It All Just A Dream is a muted turquoise creme. I'm so undecided about this shade on me. When I swatches it I wasn't loving it, however I did some nail art with it (which I wore for 24 hours) and it really grew on me. 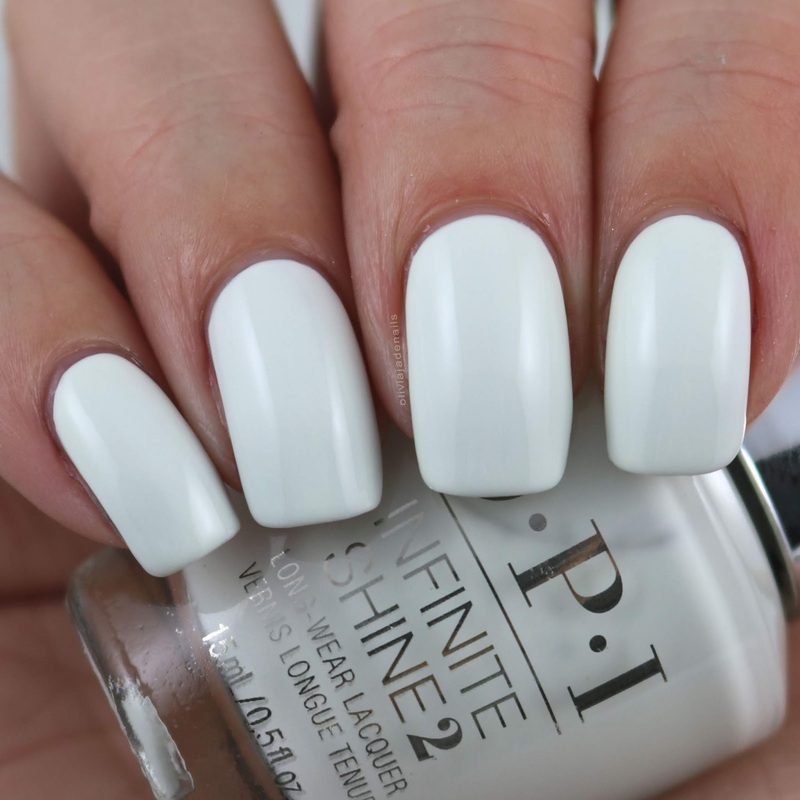 The formula is great and is opaque in two coats. You're The Shade I Want is a raspberry pink creme. Now this is more my colour. I think it's really pretty and the formula is great. My swatch shows two coats. I really wanted to love this collection, however it was a little underwhelming. I don't think that a lot of the shades agree with my skin tone and the shades aren't overly unique or exciting. What do you think of the Grease Collection? Yesterday I shared with you the soon to be released Holo Hookup polish swatches and today I have some nail art to share with you using the polishes. As it is the middle of winter here sunshine is somewhat hard to find so I do apologize for the lack of sunshine pictures. You can see each polish in direct sunlight in yesterday's post. Right - on to the nail art! 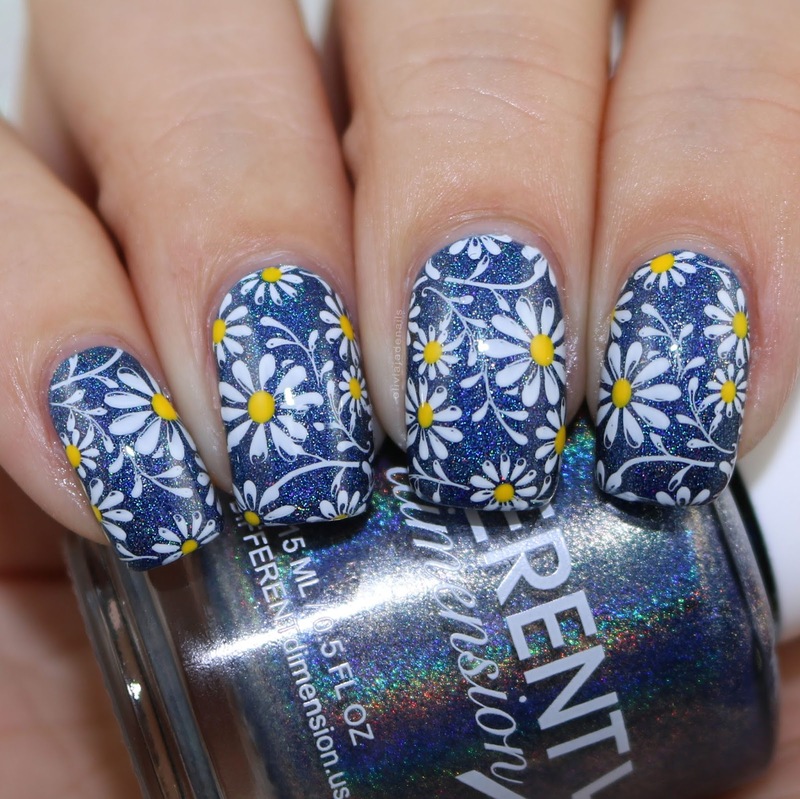 Different Dimension Hit Me With Your Best Pot - stamped with Powder Perfect's White Stamping Polish and Bundle Monster E-tronica. Image is from Bundle Monster BM106. 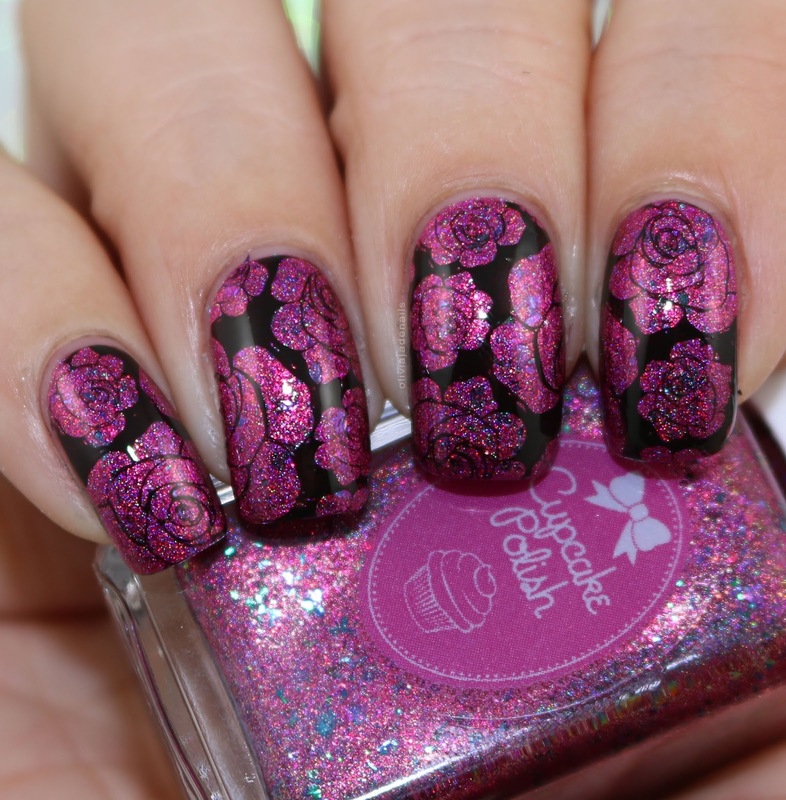 Cupcake Polish Brew-tea-ful - Stamping polish is Powder Perfect's Black Stamping Polish. Image is from Uberchic 1-02. 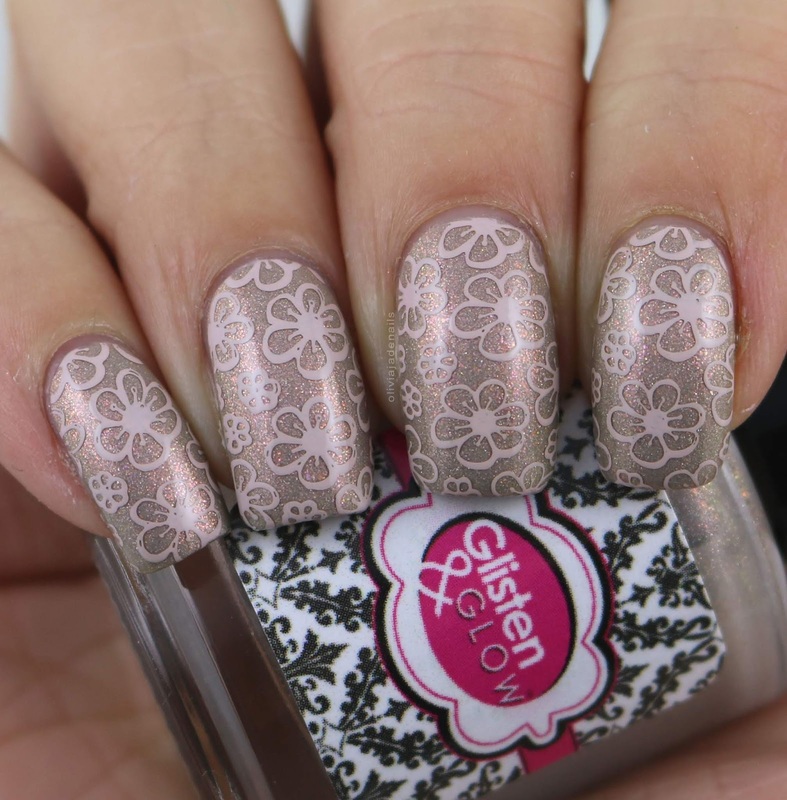 Glisten & Glow Let's Get The Par-tea Started - Stamping polish is B Loves Colour B An Ice Coffee. Image is from Uberchic 21-02. Grace-full Nail Polish Cute Tea - for some reason I didn't make note of what I used to do this mani. Sorry. I also did a mani using all for polishes together. To be honest with you I don't think that these four polishes work well in a mani together. 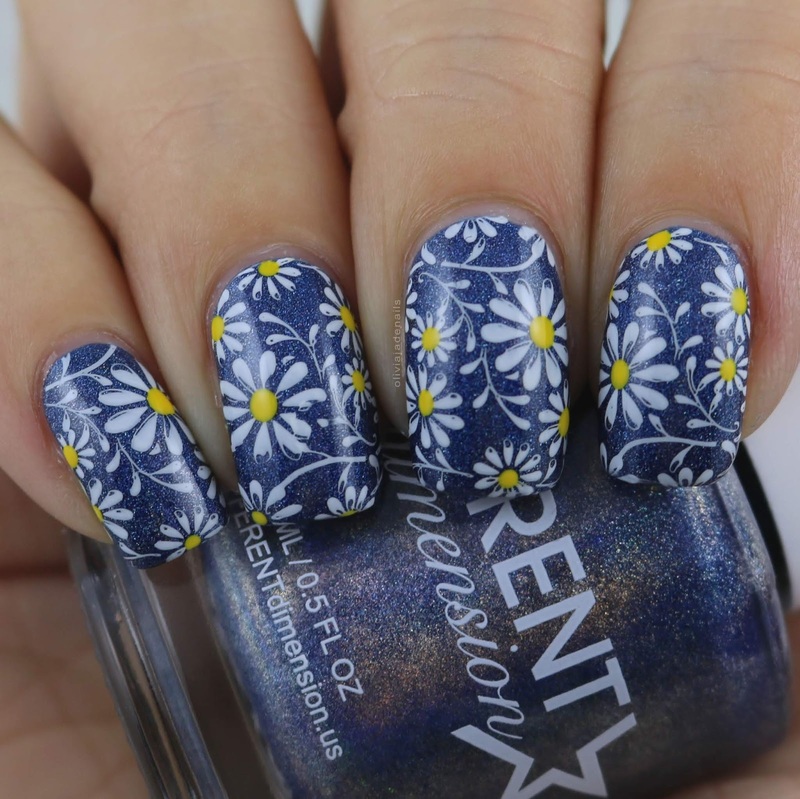 For this mani I used Powder Perfect's Black Stamping polish and Bundle Monster BM-S188. That's all from me today. I hope you guys enjoyed this post. 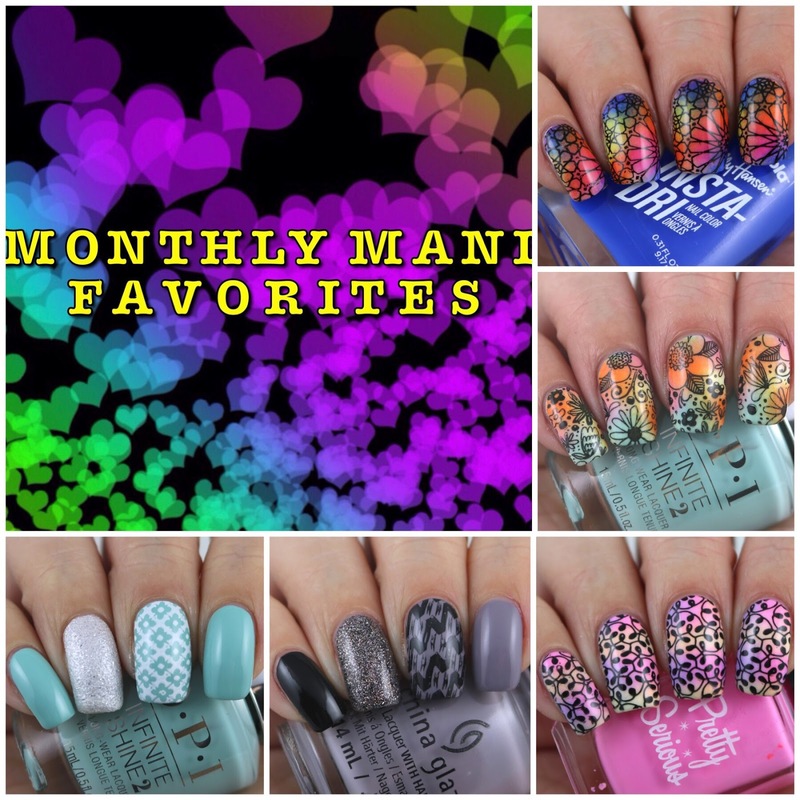 Which mani is your favourite? Today I have something new to share with you guys - The Holo Hookup. To be honest, before I was asked to swatch the August polishes I hadn't even heard of the Holo Hookup. Yes I may be living under a rock, but in all fairness there is so many new polish brands, Facebook groups and subscription box types of things it's hard to keep up. Anyway, I always love trying out new things so I naturally said yes to swatching the August polishes. The theme for this month is Tea Party. Cupcake Polish: Brew-tea-ful is a mulberry linear holographic polish with blue/teal/purple/pink shifting flakies and a red to gold shifting shimmer. We all know I love holographic polishes with flakies and this one is a really pretty one. The formula is great and is opaque in two coats. Different Dimension: Hit Me With Your Best Pot is a dark sapphire blue linear holographic. Nice colour with a good formula. I used two coats for my swatch. Glisten & Glow: Let's Get The Par-tea Started is described as a light beige creme based linear holographic polishes loaded with pink/red/gold shifting aurora shimmers. This one is gorgeous in the bottle but sadly it is really sheer. It definitely needs a base colour underneath. I used four thick coats for my swatch (and it still isn't completely opaque). 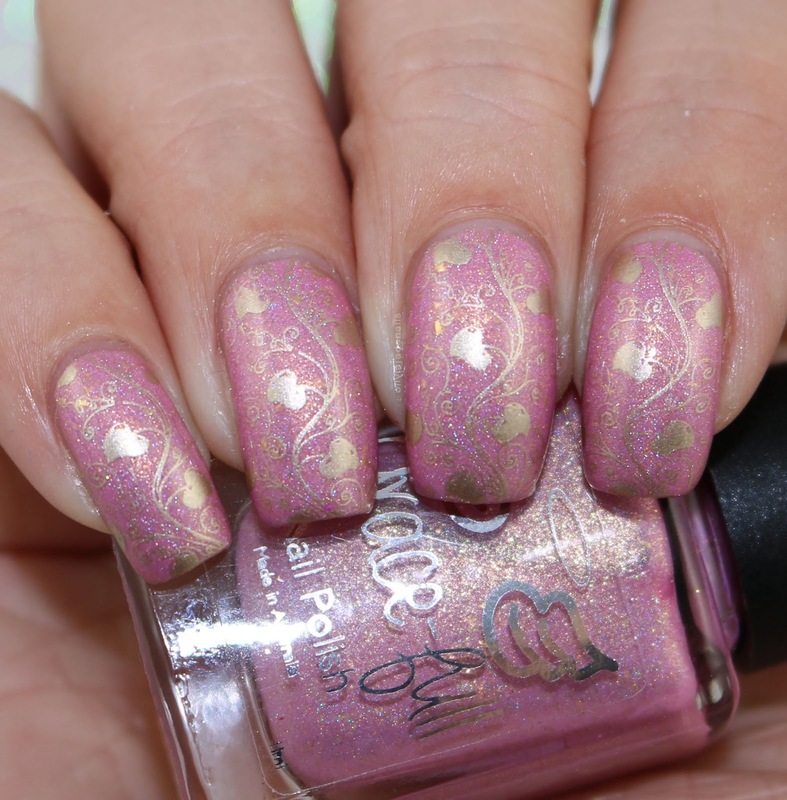 Grace-full Nail Polish Cute Tea is a soft light pink linear holo with gold shimmer and gold flakes throughout. I quite like this one. It's a pretty pink and I really like the added gold shimmer and flakes. The formula is great and easy to use. My swatch shows two coats. I quite like the polishes in this box. They are all nice colours and the formulas are all easy to work with. I do wish that the Glisten & Glow polish was more opaque though. The Tea Party box will be available for pre-order Saturday July 21st at 9pm EDT until Saturday July 28th at 9pm EDT.